This blog post was first published on May 15 2011, and revised on May 7 2015. Arcadia is a semi-rural suburb in the Hornsby shire, first opened up into a settlement by timber cutters in 1817. It is named after a region of Greece that in legend was seen as an idyllic pastoral area. The name of the Greek region means “bear”, and is after a son of Zeus from Greek mythology called Arcas, whose mother Callisto was turned into a bear. He and his mother were made into the constellations of Ursa Major and Ursa Minor – the great and little bear. Because commercial development is severely restricted in the suburb of Arcadia, it has retained an image as a rustic retreat which fits its name. The name Arcadia is a feminine form of the Greek name Arcadius, meaning “from Arcadia”. There are a couple of saints named Arcadius, and there was also an Emperor Arcadius, whose daughter was named Arcadia after him. This name, which has been more often used in continental Europe and Latin American than in English-speaking countries, feels rather exotic, and quite Utopian. It is pronounced ar-KAY-dee-uh, and you could use Arkie, Kay, or Kaydee as a nickname. Avalon is a suburb in the Northern Beaches region famous for its surf culture. An episode of Baywatch was filmed here in the 1990s, and must have impressed, as the show’s producers decided to shoot the rest of the series at Avalon Beach. However, residents complained until Baywatch went to Hawaii instead. Woot, people power! The first land grant in the area was in 1827, but it didn’t receive its name until 1921. It is named after the paradisical island of Celtic myth, where it is said King Arthur received his final resting place. It is thought the name of the island comes from the Welsh word for “apple”, as it is pictured in myth as being blessed by an abundance of fruit. Avalon has been used as a personal name since the 19th century, when anything Arthurian was fashionable, and has more often been given to girls. Fitting in with popular names such as Ava, it seems like a more mystical version of Eden or Heaven. Bronte [pictured] is an upmarket beach-side suburb close to the city centre, with scenic cliff-top walking paths to popular locations such as Cooge and Bondi. This is another suburb with a keen surf culture, and the Bronte surf life saving club, founded in 1903, claims to be the oldest in the world. It has made notable residents over the years, including Peter McCormick, who wrote the national anthem. Robert Lowe, later Viscount Sherbrook, bought 42 acres here in the 1830s. His house was completed in 1845 and named Bronte House in honour of admiral Horatio Nelson, who was the Duke of Bronte. Bronte is a place in Sicily, Italy, near Mount Etna. Its name, pronounced BRON-tee, means “the thunderer”, and as it is right near a volcano, it is easy to see how it got its name. Bronte first joined the charts in the 1990s, and was in the Top 100 by 1997, making #98. It joined the very bottom of Top 100 twice more, in 2000 and 2001, never getting higher than #93, and is now around the 400s. 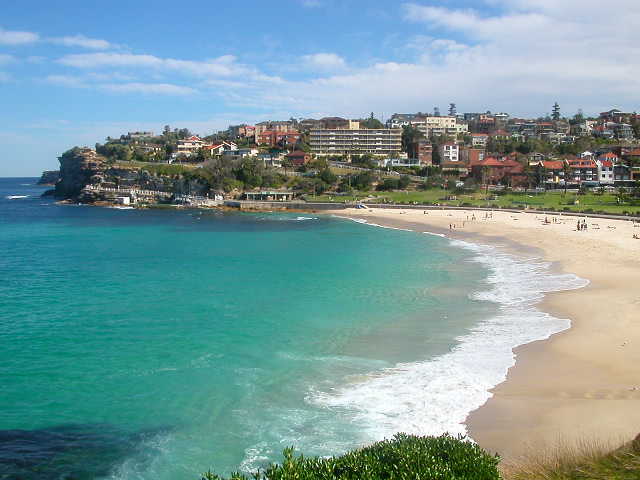 Only in Australia has Bronte attained even mild popularity, and no doubt Bronte Beach helps explain why. Elanora is another Northern Beaches suburb; it is located on a hill overlooking a lagoon and the sea. The northern and south-western sides adjoin national parks, and native wildlife abounds in the area. It’s a suburb of large houses with a country club, and is popular with tourists. Originally a coal mining camp, it came into existence as a residential area in 1929, named Elanora Heights Estate. The name Elanora is derived from an Aboriginal word which means “home by the sea” or “home by the water”. It’s easy to see the appeal of this name – it sounds exactly like the elegant Eleanora, yet has an indigenous origin and pleasant meaning. You could use popular Ella or hip Nora as nicknames. Eveleigh is an inner-city suburb, and an area of of great historical importance, because it was here that the first steam locomotives were built in Australia in the railway workshops. The Eveleigh site was also used to manufacture munitions in both world wars, and is significant in the history of unionism. In 1892, unions first successfully negotiated a six-day working week in Eveleigh, and in 917 the General Strike began there. Unlike some of the other suburbs, this isn’t just a swanky address with a nice beach, but a place with working class roots that helped forge our nation. The name Eveleigh is taken from the name of an English estate. It’s a surname that is a variant of Everly, and means “wild boar’s wood”: despite the spelling, it’s pronounced EV-uh-lee, not like Eve + Lee. Similar to popular Evelyn, this spelling may seem more feminine than Everly. Jannali is in Sutherland shire, south of Sydney. The railway was built in 1885, but few people lived in the area until the 1910s. In 1927 the township was named Jannali after a railway signal box that had been there since the beginning. During the Depression, the population of Jannali increased dramatically as people were forced to sell up and move out of the city, and it became known as a place for “battlers” who were doing it tough during the economic hardships of the 1930s. Today Jannali is an unpretentious commuter suburb. When the name Jannali was chosen, it was reported that it was an Aboriginal name from the Northern Territory, meaning “the moon”. Indigenous Australians already used it as a name, and it does have occasional use. Pronounced juh-NAL-ee, the appeal of this name is its vague similarity to names derived from Jane, such as Jan and Janelle, while having an attractive meaning and indigenous origin. It would make a bold alternative to Selena or Luna. Kareela is also in Sutherland shire, and the next suburb to Jannali. Located on the banks of the Georges River, it was first established in 1968. Its name is derived from an Aboriginal word which is said to mean either “place of trees and water” or “south wind”. It was the second meaning that the Geographical Names Board probably had in mind, as the area is known for its strong southerly breezes. Pronounced kuh-RHEEL-ya, Kareela sounds feminine and begins with the popular K sound. People who like Cara and Cordelia may also like the sound of Kareela. Rosebery is in south-eastern Sydney, near the city centre, and is the seat of local government. In the 1960s it was developed for industry and government housing, and became home to many migrants, especially Greeks and Italians. Rosebery was named after Archibald Primrose, Earl of Rosebery, British Prime Minister in 1894-95. The suburb was named in his honour after a visit he made to Australia in 1883-84. Rosebery is a variant of the place name Roseberry, on the Yorkshire Moors. James Cook once helped his father run a farm here, and climbing the high peaks gave him a taste for adventure which led him to become a sea captain and brought him to Australian shores. It looks like a nature name and sounds like Rose + Bree (ROZE-bree), but Roseberry is a corruption of the Old Norse for “Odin’s rock or crag”. Many of the place names of this area were given by the Vikings. Rosebery is deceptive – it has the air of a fairytale princess, yet its origins are ancient, powerful, and masculine. You may be intrigued by it if you would like an unusual girly name with a surprising amount of grunt. Rozelle is an inner-city suburb to the west of Sydney’s centre; Rozelle Bay surrounds the container port Glebe Island. Once a colourful working-class district, this attractive village is now fashionable and quirky. The area where Rozelle is now was part of a 1800 land grant to colonial surgeon Dr William Balmain. The land was settled in 1836, and by 1861 was divided into the suburbs of Balmain and Balmain West. By 1900, Balmain West, now a thriving suburb in its own right, became known as Rozelle, after Rozelle Bay. Rozelle Bay (often marked as “Rozella Bay” on old maps), was called after the Australian parrot, the rosella. These beautiful crimson birds were first seen at Rose Hill, the first suburb of Sydney to be established. The parrots were commonly known as “Rose Hill parrots”, then “Rose Hillers”, and finally, “rosellas”. By coincidence, there is an Italian name Rosella, and Rozelle (roe-ZEL), gives it a twist that seems quite cool. It has occasionally been used as a girl’s name. Sylvania is another southern suburb from Sutherland shire, next to Kareela. It is mostly residential, but also contains areas of native bushland. The traditional owners of this area are the Dharawal people, and their middens, burial sites and rock art remain in sheltered caves along the Georges River. After European settlement, it was acquired as a land grant by John Connell Laycock, and then shortly afterwards by politician Thomas Holt. Holt built Sutherland House on the foreshore in 1818, and a village grew here from 1881 onwards. The name Sylvania is Latin for “wooded area”, and must have been chosen because of its bush setting, but who chose it and why has been lost to history. Sylvania is already a girl’s name, a form of Silvana. However, the suburb’s name is pronounced sil-VAYN-yah and may sound too much like Pennsylvania and Transylvania for some. Peoples’ favourite names were Bronte, Avalon, and Elanora, and their least favourites were Kareela, Jannali, and Sylvania. Wow! Elanora is one letter off my daughter’s name. I’m from Sydney originally (now living in Reykjavik, Iceland) and had no idea (or had long forgotten) there was a suburb called that. The meaning “home by the sea” or “home by the water” is just perfect for an Australian-Icelandic child. I have always considered using Avalon but I’m not sure if I’m game enough lol. I’d probably use Kareela too but only on the basis that it was where my grandmother lived for most of her life and where she passed away. Great list again!! I would use Avalon except it would sound really weird with our surname. Thanks, I came up with Kareela myself, and can’t figure out why it isn’t used as a name – it sounds like one. Yes I suspect that Bronte is actually a locational name rather than a surname one. The Bronte sisters themselves were amused by the fact that their surname was coincidentially also a Greek word related to thunder, and made lots of jokes about it in their family poems and stories. I love the name Bronte, although I pronounce it BRON-tay. Aside from that, I would consider Elanora, but would probably opt for the Eleanora spelling, for obvious reasons, or even Leonora. Ooh, Leonora is very pretty. It sounds a bit Gothic.